Today our neighbor brought us some walleye along with her Walleye Skewers with Remoulade Sauce recipe, which was featured in Edible Twin Cities magazine Sept-Oct 12. Unfortunately, I didn't have all of the ingredients but I was able to substitute and come up with some fantastic flavor. Combine all ingredients in a blender or food processor EXCEPT the oil, blend until smooth. Slowly add in vegetable oil a couple teaspoons at a time. 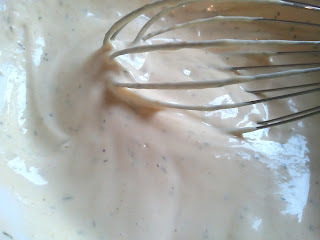 The point is to emulsify so the oil does not separate, continue doing this until the mixture is smooth. Transfer to a container, cover and refrigerate for an hour. Marinate strips in buttermilk for 2-4 hours, not longer. Heat two inches of Canola oil. Combine flour, salt & pepper in a shallow dish. Drain buttermilk from fish pieces, then coat in flour mixture. Fry 4-5 minutes each side. 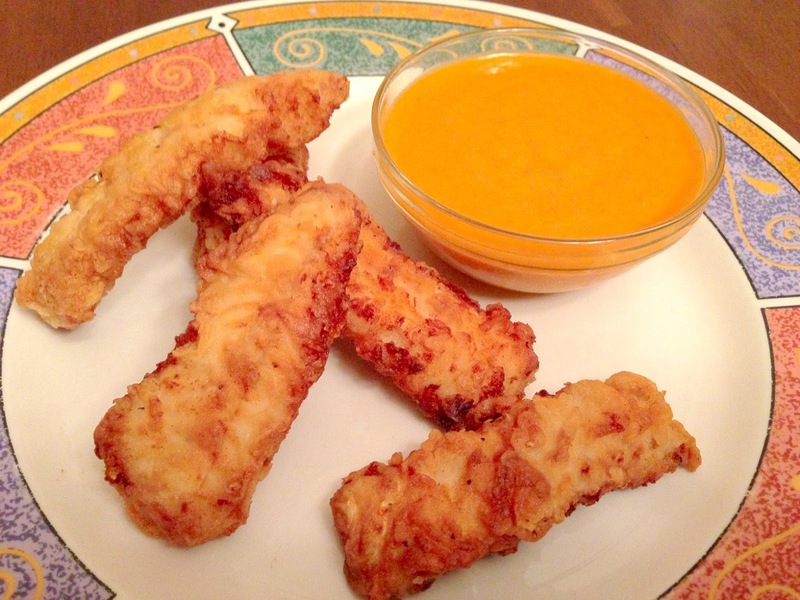 Serve with remoulade. It's been a while since we posted a recipe; this is such a busy time of year! Archery season has started, fall semester, pre-school and other fall plans have taken priority. We haven't had much free time on our hands for our projects, but we will post as often as we are able. I had some Asian pulled pork at a friends house for their daughters 1st birthday party, and it inspired me to make this Asian style pork. 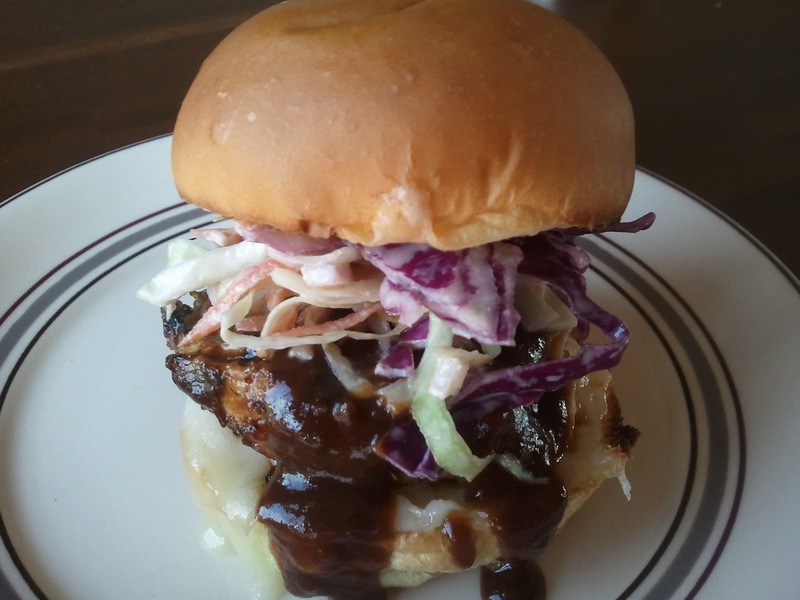 This Asian Pulled Pork is really good, it has more of an Asian spiced flavor with subtle sweetness. The Chinese five-spice gives it a unique spiced flavor, the brown sugar brings balance and just the right amount of sweetness. Add everything besides the meat to a slow cooker & whisk the ingredients. Remove from slow cooker, shred, pull and return to slow cooker. Pairs well with a good ramen salad. This past Monday we got to visit with Joe's Grandma Gladys who's in town visiting from Puerto Rico. We got to talking about some of our favorite delicious Puerto Rican dishes. I had seen this dish on Diner's, Drive-In's & Dives on Food Network but couldn't remember it's origin or what it was called. 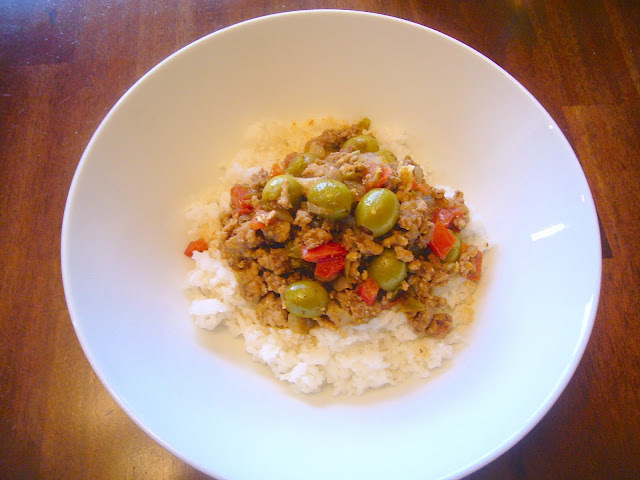 All that talk about Carribbean food got me thinking about Picadillo again and I finally googled what it was called. 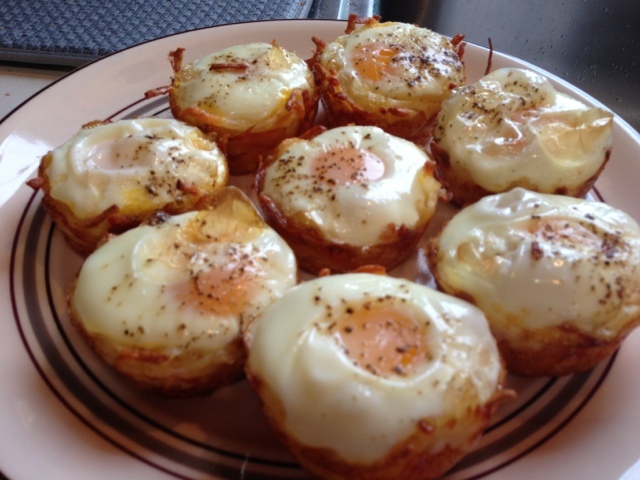 This particular recipe is inspired by a recipe I found in iCuban.com. It called for less garlic and olives, so I decided to tweak the recipe a little bit and add a couple flavors I knew we would love. Joe and I both agree that this is as delicious as we thought it would be and intend to make it again and again! Enjoy!! Makes about 6 hearty servings. Saute onions and green peppers in olive oil until onions begin to soften. Add the meats and garlic. As the meats cook, mash the meat into the pepper and onion mixture to break it up into a fine crumble. Once the meat is cooked through, add in the tomatoes, tomato paste, chili powder, spices and salt & pepper. Reduce heat to low, and simmer about 15 minutes. Finally, gently stir in the olives and simmer another 5 minutes. Serve over hot white rice. Rinse rice thoroughly in wire mesh strainer. This step is very important. Rinse rice until runoff water is completely clear. Set rice aside to dry for about 15 minutes. In medium stockpot heat the oil on medium heat. Add the dry rice and salt and toast for about 10 minutes, until you smell the nutty aroma of the rice toasting. Stir throughout toasting process so the rice doesn't burn. Add the water and stir gently. Reduce heat to medium/low and place the lid on the pot. DO NOT OPEN THE LID through the entire cooking process. Set timer for 20 minutes. If the rice boils over, or gets close, reduce the heat slightly. After the 20 minute cooking time turn the heat off, but leave the lid ON for another 30 minutes to steam the rice. The 30 minute steam makes such a difference on the texture of the finished rice. Yesterday Raina and I went with the Lindbergs on a fishing excursion to find crappies and blue gill at Lake Pokegama. It was getting dark and most of use had caught fish, except for Raina. Then WHAM! a catfish nails her crappie tube jig almost top water! It was crazy! She fought hard with her drag set and brought in a nice sized catfish. We were all a little surprised to see a catfish hit that high in the water and on a tube jig! So after a fun night fishing and some much needed time with the Lindberg family we came home and I thought about what I wanted to do with the catfish. I remembered my mom making pan fried catfish with lemon pepper and I immediately had a craving for it. I thought I'd spice it up a bit and make a homemade lemon pepper rub. The rub turned out great and the kitchen smelled amazing with all the lemon zest in the air. Makes enough for approximately 3 fillets. Zest lemons, be sure not to zest too far under the lemon skin as the white part is bitter. 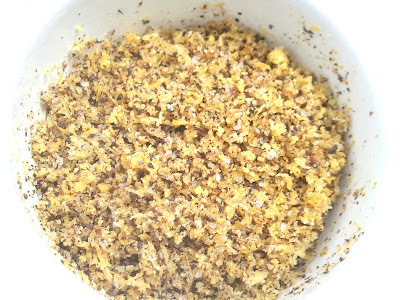 Crack pepper and combine all the ingredients, taste and add ingredients to desired flavor. For a more potent lemon flavor add more lemon zest. In a cast iron skillet (or an adequate frying pan), add canola oil to fill the pan about 1/4 inch. Preheat oil and prep fillets. Wash fillets fillets with cold water and pat dry with paper towels. Use a little oil to cover the fillets to help the lemon pepper rub stick. Coat both sides of the fillet with the lemon pepper rub. Test oil with the tip of a fillet to make sure the oil is at an adequate temperature. If the oil doesn't start frying the fish, remove immediately until oil is ready. Fry until fish is golden brown or until fish is just about to flake. Remove and put on paper towels to remove excess oil. Serve with lemon slices and parsley, squeeze fresh lemon juice over the fillets and enjoy! On Monday I arrived at the office and had a big surprise...a cooler full of salmon from my boss! It was a great way to start out the week! The salmon was split up between just a few of us, so now I have plenty of salmon in our freezer. This is definitely our family's favorite fish! We took a package out on Monday night and put it in the refrigerator to thaw. Today I prepared it grilled with very simple Dill & Dijon Remoulade that I've been making since 2006, tonight was my first night measuring ingredients and writing instructions. I recommend this dish any time of the year! Today we served this with rice pilaf which paired excellently with the remoulade and salmon. This salmon also pairs well with grilled asparagus with E.V.O.O., fresh minced garlic, salt & pepper. Remove any extra bones from fillet with a needle-nose pliers, feel around the fillet for bones and pull with the grain to avoid tearing the fillet. With a fillet knife, remove the skin from the salmon fillets. On each side, rub fillets with the olive oil and season with the cracked black pepper, Old Bay, Garlic granules and top it off with a little coarse kosher or sea salt. Don't over salt, there is salt in the Old Bay seasoning. With a tongs take a napkin or paper towel and dip in some oil and rub the grates of the grill to prevent sticking. 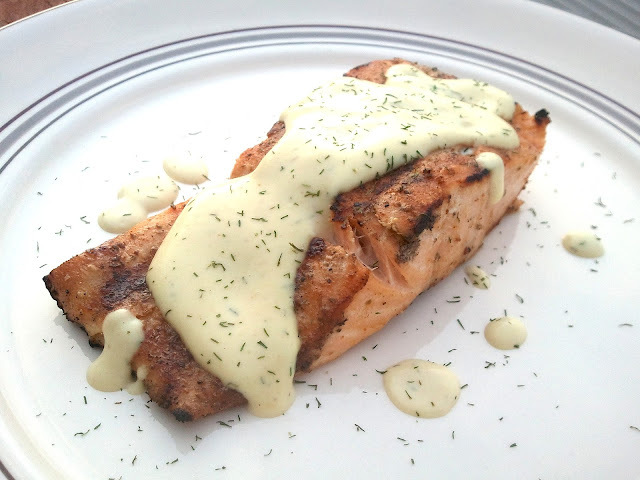 Put salmon on the grill for about 2-3 minutes per side, adjust to fit your level of doneness. Combine all of the ingredients in a mixing bowl and whisk until smooth, add more dill for color or to your desired flavor. 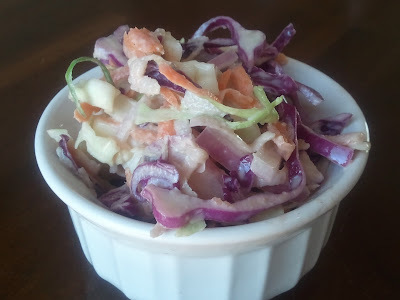 Serve with over the grilled salmon fillets and enjoy!